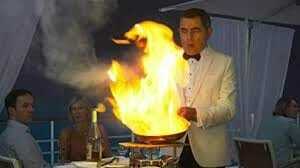 Rowan Atkinson is one of my favorite English actors. I’ve watched him in British comedy since I was young, growing up on the likes of Benny Hill and Black Adder. While I’m always going to love him best in Blackadder, I enjoyed him in the spy spoof movie Johnny English and was interested to see what the writers would do for the newest installment in the series. The film was exactly as I expected, silly fun and entertaining with great comedic moments by both Rowan Atkinson and Ben Miller. In this third movie in the Johnny English series, it is digital versus analog. MI7 receives a cyber attack exposing the identities of all their operatives. 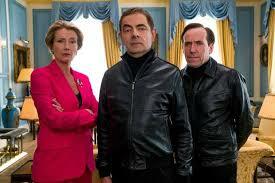 Unfortunately, that leaves them without any agents to actually investigate the attack so Pegasus (Adam James) brings in former agents, including Johnny English who has been working as a geography teacher secretly training his students in espionage. Accidentally eliminating the other former spies, Johnny is MI7’s last hope to find out who launched the attack. Johnny requests the assistance of his old partner Bough and the use of a few tools, but not a smartphone, deciding to go old school for the mission, including the use of an Aston Martin instead of the new hybrid car. With his usual ineptness, Johnny gets to work. Meanwhile, the prime minister (Emma Thompson) seeks help from a Silicon Valley billionaire Jason Volta (Jake Lacy) who she hopes to convince to go with her to the G12 meeting. He will only help if he gains access to Britain’s systems. This access leaves the rest of the G12 nations vulnerable. Johnny must find a way to convince the Prime Minister that the man she trusts is out to harm the world but he’ll only manage it with help from Bough, a covert Russian agent, Ophelia (Olga Kurylenko) and his own unexpected tendency to bungle his way to success. Comedy can always be a bit tricky. What one person likes, another doesn’t but Johnny English Strikes Again embraces its very British nature, delivering a send up of spy films in general and modern society’s overdependence on technology specifically. From the beginning, as Johnny teaches his young pupils to excel at spying to his bungling using simple technology like smartphones and rockets, relying on Bough, the movie shows analog vying with digital, the digital allowing the villain to hack the British government’s systems. While Johnny struggles with his analog tools as much as the digital, it is moments such as when Johnny is detected because of the use of technology or when using a smartphone allows him to deter an attack that are the funniest comedy jewels in the movie. The movie is silly fun, including cameos from Charles Dance and Michael Gambon, a sly nod to their involvement in British film and television. Johnny English uses an Aston Martin, mostly because its cool but also because it can’t be tracked. One of the funnier moments is when the fancy Aston Martin runs out of gas unlike the newer, electric car. We also have scenes with his pupils camouflaging themselves or Bough coming up with all the best plans. While none of these scenes are new to the comedy scene, it all combines into a charming film. 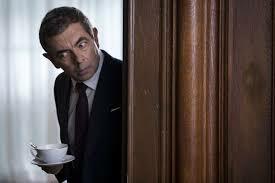 Rowan Atkinson does a fantastic job of balancing the cluelessness of his character with the abilities of a trained spy. It is a great cross between his role as Bean and his previous role as Blackadder. Nothing quite works for Johnny English, he tends to mess up far more often than succeeding but he is far more sophisticated character than Bean. It takes a great deal of skill to balance that type of presentation and to nail the comedy elements in each scene. 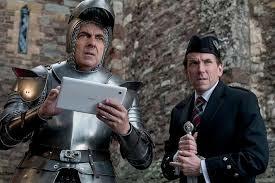 Ben Miller is also crucial to the humor, playing a terrific foil to Rowan Atkinson and he does so perfectly. He has perfect timing, the straight man to the silliness. He also has all the plans and it is clear that is only with his character’s plans that the pair succeed. 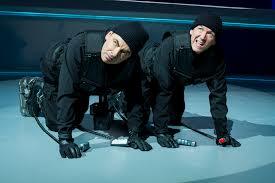 Ben Miller is precise with his acting and the movie succeeds due to Rowan Atkinson and Ben Miller’s genius. I also happen to think Emma Thompson is brilliant in her part as Prime Minister, believable in her willingness to hand over the keys to the kingdom to help her country with its struggles. What causes issues is that the story is simple and the jokes are easy to predict. It is clear from the beginning who the villain is and he’s not thoroughly developed, leaving him a bit one dimensional. We also don’t see a lot from the character of Ophelia, the Russian spy. Olga Kurylenko plays her part with sexiness and grace but there isn’t a lot of depth to her character. Despite this lack, the humor is entertaining and kept me laughing. If you liked the previous Johnny English movies, if you like British humor, which is very tongue in cheek, or if you like either Rowan Atkinson or Ben Miller, this film will definitely be worth your time. Even though the comedy is silly, there are some interesting concepts surrounding the digital age and how analog tools can be useful. It is quite interesting how reliant society has become to our digital tools and how easy it is to remove them. I found it intriguing and the comedy aspects, especially the young spies totally enjoyable. Rating 3.5 Aston Martins out of 5.